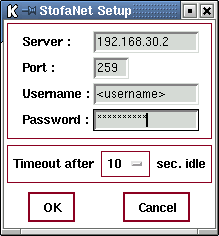 A collection of scripts which signon to StofaNet (Danish ISP) from a Linux box. If you have a dynamic IP address you might also be interested in visiting DynDNS. StofaNet now offers an Always-On service, which somewhat deprecates this collection of scripts. This is a SysV Init script. It is especially useful if any of the sysvinit started daemons need internet access (e.g. ntpd). if test "$1" = "log_af"
echo -n "$NAME: Starting ISP connection... "
echo -n "$NAME: Stopping ISP connection... "
update-rc.d stofanet.sh start 50 2 3 4 5 . This is the GUI of a Tcl/Tk script. The script monitors /proc/net/snmp for outgoing connections and only signs on when needed. After the specified idle timeout it signs the connection off. This is very useful when paying per minute uptime. This is a telnet based signon; kind of a poor mans Expect script. This technique could probably be useful in other similar situations. ## (at your option) any later version. echo "Usage: `basename $0` 1|2|3"
echo "   1 = signon"
echo "   2 = signoff"
echo "   3 = status"
This is by far the most boring form of StofaNet signon! Make browser bookmarks pointing to the following URLs; The first URL signs you on, the second signs you off.